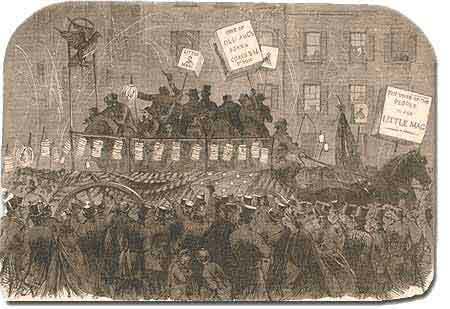 This torchlight parade for George McClellan, the Democratic nominee for President took place in New York City in 1864. It is hard for modern Americans to believe that Abraham Lincoln, one of history's most beloved Presidents, was nearly defeated in his reelection attempt in 1864. Yet by that summer, Lincoln himself feared he would lose. How could this happen? First, the country had not elected an incumbent President for a second term since Andrew Jackson in 1832 — nine Presidents in a row had served just one term. Also, his embrace of emancipation was still a problem for many Northern voters. Despite Union victories at Gettysburg and Vicksburg a year earlier, the Southern armies came back fighting with a vengeance. During three months in the summer of 1864, over 65,000 Union soldiers were killed, wounded, or missing-in-action. In comparison, there had been 108,000 Union casualties in the first three years. General Ulysses S. Grant was being called The Butcher. At one time during the summer, Confederate soldiers under Jubal Early came within five miles of the White House. 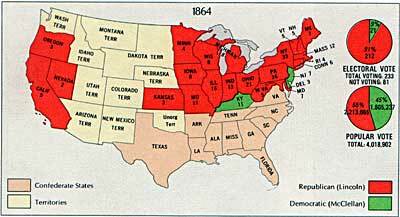 The states which Lincoln won in the election of 1864 are shown in red. McClellan won Kentucky, New Jersey, and Delaware. Notice that citizens of the Confederacy did not vote in the election. Lincoln had much to contend with. He had staunch opponents in the Congress. Underground Confederate activities brought rebellion to parts of Maryland. Lincoln's suspension of the writ of habeas corpus was ruled unconstitutional by Supreme Court Chief Justice Roger B. Taney — an order Lincoln refused to obey. But worst of all, the war was not going well. Former General George B. McClellan and his running mate, George Pendleton (who later began the U.S. Civil Service) were strongly favored to win the election of 1864. Meanwhile the Democratic Party split, with major opposition from Peace Democrats, who wanted a negotiated peace at any cost. They chose as their nominee George B. McClellan, Lincoln's former commander of the Army of the Potomac. Even Lincoln expected that McClellan would win. The South was well aware of Union discontent. Many felt that if the Southern armies could hold out until the election, negotiations for Northern recognition of Confederate independence might begin. Everything changed on September 6, 1864, when General Sherman seized Atlanta. The war effort had turned decidedly in the North's favor and even McClellan now sought military victory. Two months later, Lincoln won the popular vote that eluded him in his first election. He won the electoral college by 212 to 21 and the Republicans had won three-fourths of Congress. A second term and the power to conclude the war were now in his hands. From the Inaurgural Addresses of the Presidents of the United States website at Columbia University's Bartleby Library, is the complete text of Abraham Lincoln's Second Inaugrual Address delivered on March 4, 1865. This is the speech in which he urges Americans to work together to heal the nation, "(w)ith malice toward none, with charity for all...."
From the Canadian Government site on Canada's confederation (1867), we learn that there was a movement in the United States to annex Canada and that the Republicans made annexation one of the issues in the 1864 Presidential election. The site includes the transcript of a bill for annexation passed in the U.S. House of Representatives in 1867 and several political cartoons about annexation. Lincoln's opponent in the Presidential election of 1864, George McClellan, had once been the commander of the Army of the Potomac. The two had their differences even then, as this letter from Lincoln to the general indicates. Lincoln later replaced McClellan. The Democratic party convention was held in Chicago in 1864. The Valley of the Shadow project of the University of Virginia offers a transcription of a newspaper article reporting on the event and another praising the convention's nomination of George McClellan and George Pendleton as its Presidential and Vice-presidential candidates. Some of Lincoln's contemporaries suggested that the 1864 election be postponed until after the Civil War. Lincoln wasn't having it. Read this letter and see why Lincoln felt the election was necessary and important for the nation. 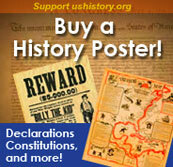 Posters and cartoons were the TV commercials of 1864. 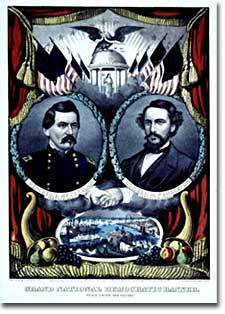 Check out Lincoln and McClellan's ploys to get elected President. A new book claims that if the McClellan had won the election, the Union might have lost the Civil War. In 1862, Lincoln said, "I hope to have God on my side, but I must have Kentucky." Two years later, it was one of only three states that Lincoln lost in the election.